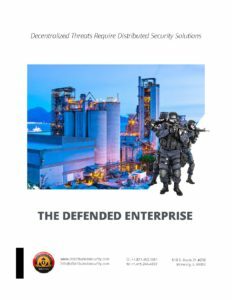 The Distributed Security, Inc. 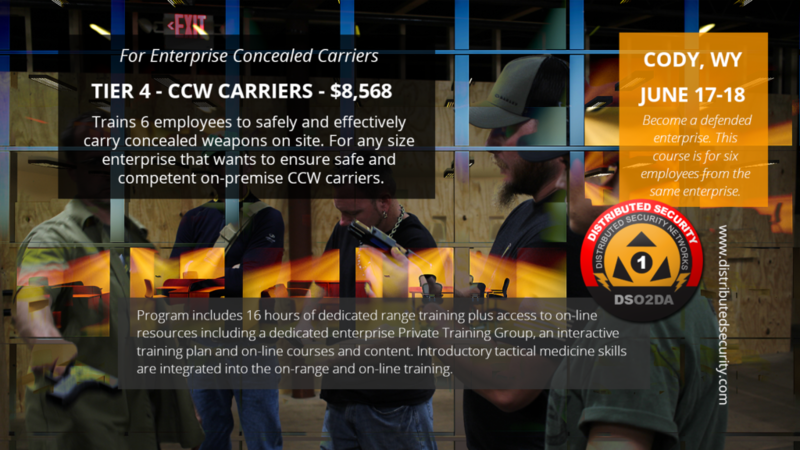 Tier 4 Enterprise CCW program trains employees to safely and effectively carry concealed weapons on site. This is not a typical concealed carry permit course and is designed for six employees from a single enterprise desiring serious training. Location for the program is Cody, WY, which offers direct access to Yellowstone and other tourist destinations should employees want to bring their spouse or family. 1. 16 hours of dedicated range training. 2. Access to on-line resources, courses and content. 5. Introductory tactical medicine skills are integrated into the on-range and on-line training. This program requires a minimum of 6 employees per class. The on-range portion of the course is two days in length. There are also pre and post course preparation and follow up activities conducted on-line via the Defense Academy. Total cost for the enterprise is $8,568 which includes 12 months access to the Private Training Group. Qualifying students receive the DSI “Tier 4 Defender” certification. Range facility surcharge may apply based upon location of client. Send email to info@distributedsecurity.com or call 1.877.452.0951 for details. For more details on what is included please download our enterprise offerings brochure. Register now for DSI’s Tier 4 Combative Firearms Instructor (CFI) Certification Course – Friday, August 09 to Sunday, August 11th. 2019, in picturesque Cody, Wyoming and expand your service offerings and support dramatically. 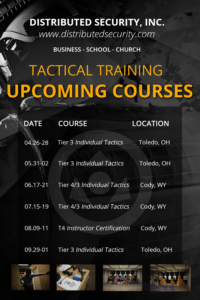 Registration closes May 3rd, 2019 for our Tier 4 Combative Firearms Instructor (CFI) certification course. Only 1 of 5 seats remains available and candidates are accepted on first come first serve basis, so reserve your seat now. We believe a well armed, well trained, and coordinated society is a secure and sustainable society. Military and LEO instructors; would you like to expand on your current curricula and utilize your hard earned firearms and tactics skills across broader market segments? Would you like to be a part of a growing organization of motivated professionals like yourself? Military or LEO Firearms & Tactics Instructor? Register now for DSI’s Tier 4 Combative Firearms Instructor (CFI) Certification Course – Friday August 09 to Sunday August 11th. 2019, in picturesque Cody, Wyoming, to expand your service offerings dramatically. 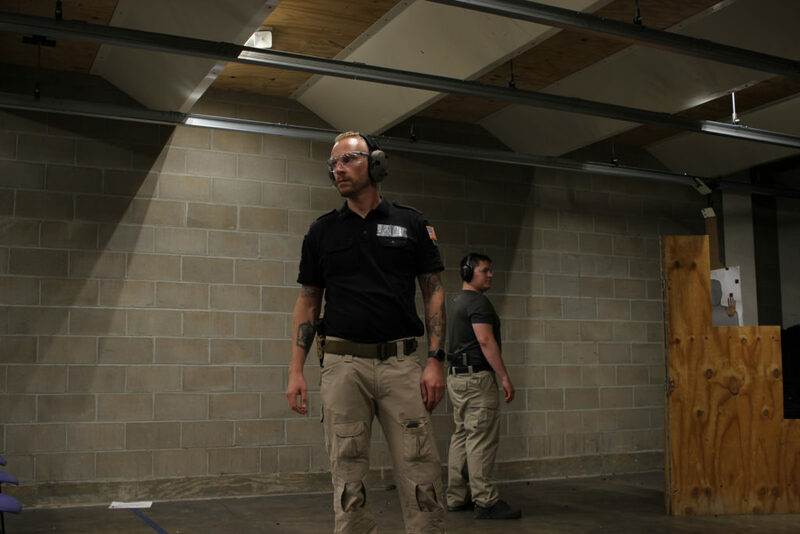 Registration closes May 3rd, 2019 for our Tier 4 Combative Firearms Instructor (CFI) certification course. Only 2 seats remain available and candidates are accepted on first come first serve basis, so reserve your seat now. An armed, well trained, and coordinated society is a secure and sustainable society.